Sanchi is famous for outstanding specimen of Buddhist art and architecture, belonging to the period between the third century BC and the twelfth century AD. 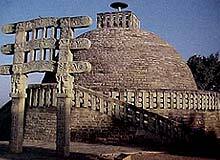 The most important of all the Sanchi monuments is the Sanchi Stupa. Stupas are large hemispherical domes, containing a central chamber, in which the relics of the Buddha were placed. The Sanchi Stupa is one of the best preserved early stupas in central India. The Sanchi Stupa is surrounded by a railing with four carved gateways facing all the four directions. During the Shunga period the Sanchi Stupa was enlarged and faced with stones and decorated with railings, staircase and a harmika on the top. Around the main Stupa, there is a path for circumambulation. This path is enclosed by a railing with gates at each of the four directions. The railings and gates of the Sanchi Stupa are richly sculptured with different motifs and designs. Another interesting characteristic about the Sanchi Stupa is that Lord Buddha has been symbolically represented by footprints, wheels, thrones etc rather than by his own image. The gateways of Sanchi stupas contain ornamented depiction of incidents from the life of the Buddha and his previous incarnations as Bodhisattvas described in the Jataka tales. 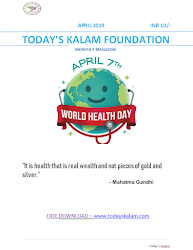 The Buddha has been shown symbolically in the form of tree or through other inanimate figures. The Stupa at Sanchi is one the most wonderful structures of ancient India. It has been included by the UNESCO as one of the heritage sites of the world. The Sanchi Stupa is a fine example of the development of the Buddhist architecture and sculpture beginning from the 3rd century B.C. to the 12th century A.D. The site of Sanchi was discovered in the year 1818 by General Taylor and an archaeological museum was established in 1919y Sir John Marshall.